Relax alongside your loved one with a couple’s massage at one of San Diego’s premier spas. Whether you want to unwind, rejuvenate, find balance or indulge in a little pampering, the region offers a myriad of spa sanctuaries where you can do yoga in a eucalyptus grove, enjoy a massage in a seaside cabana, or just relax under a Roman waterfall. Check out San Diego destination spas. Sweet Petite Confections offers two-hour chocolate-making classes about once a month ($40-$50). February’s classes conveniently land the weekend before Valentine’s Day. Choose to either make chocolate for or with your special someone. Create molded chocolates, dipped strawberries, candied bacon and more. On Valentine’s Day, San Diego Museum of Art is wooing visitors with tours of love-themed art every half-hour from 5:30 until 8:00 PM, followed by a picnic basket dinner (gourmet sandwiches, a cheese plate, dessert, and bottle of champagne). Eat dinner at neighboring Panama 66, then stroll the sculptures of the May S. Marcy Sculpture Court and Garden. Since these outings run all year, pick any day for a tour by San Diego Beer, Wine, and Spirits Tours. Every day in February, they are offering a chauffeured three-winery tour of San Diego County wine country. Or opt for a four-brewery outing along San Diego’s trolley, or a romantic day of riding the coastal train while sampling 15 wines and eating lunch. 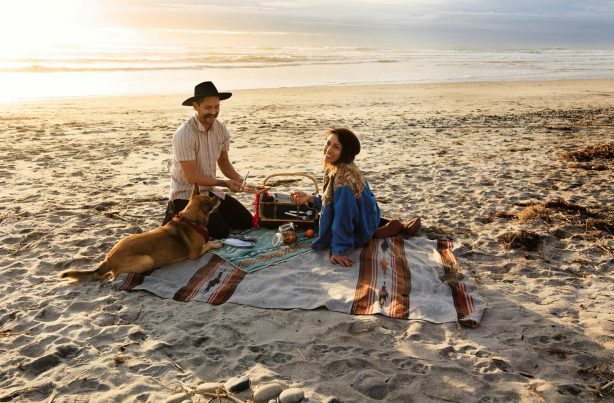 February is as good a time as any to grab a blanket and fill a picnic basket with snacks and drinks, and head to your favorite beach—or Balboa Park for that matter. This time of year, look for Southern California’s famous pastel blazes to light up the horizon between 5:00 and 6:00 PM. This entry was posted in Entertainment by San Diego Magazine. Bookmark the permalink.